Music education has been proven to improve academics, teamwork skills, creativity, and artistic self-expression. The New School of Music is a 501(c)(3) nonprofit community music school in Austin founded in 2013, which provides a non-competitive and challenging atmosphere where people are able to study all styles of music, on the instrument of their choice, or through vocal studies. We change lives through music. Our teachers are highly credentialed music educators and performers, who share our passion for enriching the lives of our music students. To date, we have provided over 3600 music lessons to over 120 underserved youth. Music education has been proven to not only help develop the areas of the brain involved in language and reasoning, but to also improve teamwork skills, creativity, academics, and artistic self-expression. When you improve the life of a child through music education, you impact their family in a major way – for generations to come. Mission Statement - To serve the community by sharing the gift of music, through connecting world-class professional musicians with students of all ages, in a lifelong study and enjoyment of music – while helping provide music instruction to underserved youth. Our Year Round School -- We teach music in co-located spaces with our partners, which enables us to keep our overhead cost low -- which allows us to scholarship more underserved kids. Our main location is 2601 Exposition Blvd (Tarrytown United Methodist Church), and we also teach in northeast Austin at Cedars International Academy (preK-7) and Cedars International High School (8-12). Our World-Class, TEXAS JAZZ & BLUES CAMP (www.TexasJazzAndBluesCamp.com) This is a partnership between the New School of Music, Austin and the Litchfield Jazz Camp in Connecticut. Litchfield has a deep and rich history of providing a top tier national jazz camp for 20 years, using top NYC based jazz artists and educators. 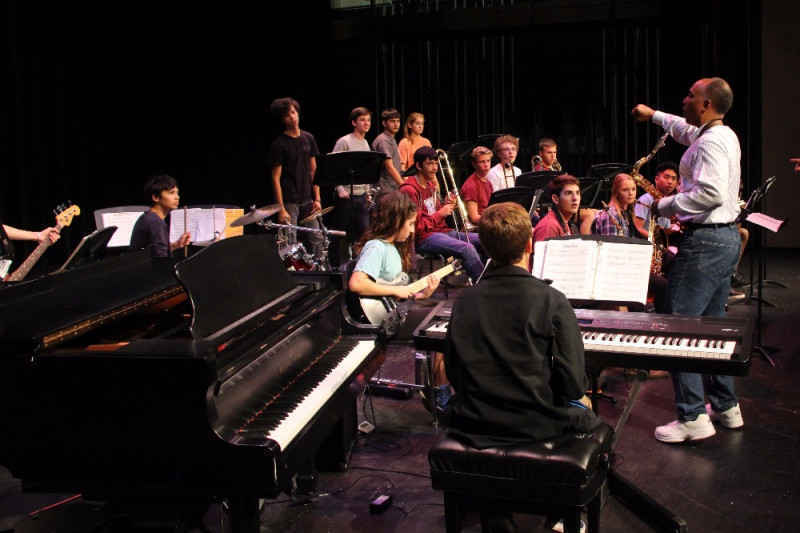 Don Braden , a world-class jazz educator and performer is the Jazz Music Director for both the Texas Jazz & Blues Camp & the Litchfield Jazz Camp. Don is based in the NYC area, is a former sideman with Wynton Marsalis, Freddie Hubbard, Tony Williams, Roy Haynes, and is a Harvard alumni. Mike Flanigin , is our Blues Music Director, and is a world renowned jazz & blues organist who works with Jimmie Vaughan, Billy Gibbons, Steve Miller and others. We are asking our supporters and advocates to please consider making a donation of any size to our program, which also provides merit and need-based scholarships. The New School of Music has committed to help underserved children (preK-12th grade) in the community by setting a scholarship goal of 50% of our total enrollment. This scholarship program provides free tuition to underserved children for their music instruction in our program. The New School funds these scholarships through paid tuition, revenue proceeds, and contributions. Scholarship candidates are identified by the New School and its partners, and are selected based on economic need, desire to learn, and commitment. Music education has a huge impact on young lives! Please join us in helping us to invest in the music education of underserved youth through your tax-deductible donation. New School of Music Fund -- Our goal is to build a core of 100 New School of Music Partners who give $1200 per year, or $100 per month, to help build our school and camp – while providing scholarships for up to 50% of our enrollment to underserved kids. These are our co-visionaries who share our passion for impacting lives through the gift of exceptional music education.